Oil investors, their wounds still fresh from last year’s sharp selloff, are again growing bullish on crude. 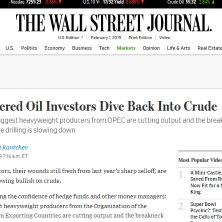 Supporting the confidence of hedge funds and other money managers: signs that heavyweight producers from the Organization of the Petroleum Exporting Countries are cutting output and the breakneck expansion in U.S. shale drilling is slowing down. Turmoil in oil-rich Venezuela could further constrain supply. The oil price swoon late last year reflected concerns about a global economic slowdown. While those fears remain, this year’s rebound has been helped by progress in trade negotiations between the U.S. and China and stimulus measures introduced by Beijing. Rising crude prices are welcome news for drillers from Texas to Saudi Arabia. For consumers, more expensive crude acts like a tax because it leads to higher prices at the pump. U.S. benchmark West Texas Intermediate was trading at $54.08 a barrel Thursday, up more than 25% from late December. Brent, the international price gauge, fetched $61.78 a barrel. Brent between $60 and $70 a barrel is often regarded as a sweet spot for consumers, businesses and the oil industry alike. Data from Intercontinental Exchange showed that as of last week, hedge funds and other big money managers have raised their net long positions, or bullish bets, in Brent crude in six of the past seven weeks. At some 200 million barrels, it is their biggest bullish bet on crude since early November. The vertiginous price slide of late 2018, when oil fell 40% from peak to trough, was a brutal drubbing for speculators and added to already-growing anxiety in the broader financial markets. Mr. Le Mee said his fund suffered big losses in the fourth quarter and finished the year down 25%. But Westbeck added bullish positions around the turn of the year, betting that the “craziness would soon unwind.” The fund is now up around 15% in January. Energy stocks have also benefited from the rebound in oil prices, making the sector the second-best performer in the S&P 500 this year, up around 10%, behind industrials, according to FactSet. The renewed optimism is being fueled by a fall in production, which helps drain swelling tanks of crude around the world. A coalition led by Saudi Arabia, Russia and other big exporters has started implementing cuts of 1.2 million barrels a day agreed on late last year. “The Saudis are sincere about higher oil prices, they need to balance their budget. The OPEC cuts will lower stocks so I’m pretty bullish,” said Mark Gordon, portfolio manager at the Ascent Oil Fund. In the U.S., which has emerged as one of the world’s biggest oil producers in recent years, the number of active rigs drilling for crude peaked in November and is currently near an eight-month low, according to oil-field services company Baker Hughes , owned by General Electric Co.
Analysts at HSBC say signals a slowdown in production growth in the coming months, predicting that U.S. oil output will grow by an average of 1.5 million barrels a day this year, down from 2.2 million last year. “U.S. drillers are going to be more disciplined in this environment, not growing for growth’s sake,” said Rob Thummel, who manages energy assets for Leawood, Kan.-based Tortoise Advisors.